The Congress will not hold back its big guns and will pull out all the stops before the general elections, senior leader Shashi Tharoor said, asserting his party wants “defenestration” of Prime Minister Narendra Modi and his government. Tharoor, who recently wrote a book on Modi titled “The Paradoxical Prime Minister”, said the prime minister makes all the liberal statements in public such as "sab ka saath sab ka vikas" (together with all, development for all) or the "Constitution is my only holy book", but relies on the “most illiberal” elements in the Indian society for his electoral support and political viability. Speaking on Priyanka Gandhi's induction as the Congress's general secretary, the 62-year-old MP from Thiruvananthapuram said she had the charisma to galvanise voters and will be an asset to the party. “The Congress will pull out all the stops before the general elections. Priyanka Gandhi is seen as a figure with great appeal and great credibility. So far, she has been very restrained, doing behind the scenes work and confining herself to Amethi and Rae Bareli. "The fact that she is now going to take a new role is a sign that we are not holding back our big guns,” Tharoor told PTI in an interview. “The Congress party intends to aim for Modi's defenestration. We want Modi and his government's defenestration (action or process of dismissing someone from a position of power or authority)” he said on the sidelines of the Jaipur Literature Festival. Tharoor said Gandhi may have yet to prove her mettle publicly, but privately the party has seen her involved in a number of issues. “Those who have seen her even on television know how quickly she makes a connection, how fluently and idiomatically she speaks and how easily she connects with the people. She doesn't behave like a political novice,” he said. Tharoor questioned the prime minister's “complete silence” on issues like cow vigilantism, ghar wapsi and love jihad, saying paradox remains central to Modi's leadership. “Modi is the best orator in Hindi that I have seen. Yet he has remained silent when his moral leadership was called on. He modulates his voice, chooses his words to the maximum impact, uses theatrical gestures. That is part of his major political appeal. share the pain of the families of Mohammad Akhlaq, Juniad Khan, Pehlu Khan, Rohith Vemula or for the Dalit boys who were flogged in Rajasthan for skinning the carcass of a cow which was their job? Nothing on any of these cases from him. Just complete and total silence,” he said. 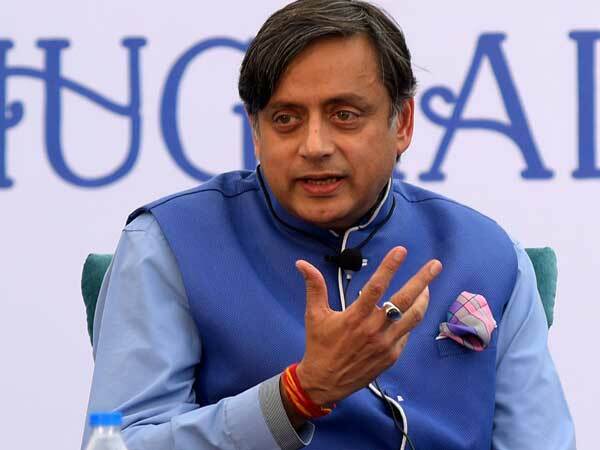 Tharoor also touched upon the controversial remark he made at the Bangalore Literature Festival, where he claimed that an unnamed RSS leader had compared Modi to "a scorpion sitting on a Shivling". The Congress leader said he cited the news article to prove there was evidence that the RSS was not fully comfortable with the conversion of Hindutva to Moditva. was a Gujarat Minister who is now one of the UP incharges for the JP. So if someone who is very much RSS-BJP has said this openly and on record, then I don't think I was wrong in quoting it,” he said. last year, he had spoken about Modi donning "outlandish" Naga and other headgear on his trips but refusing to sport a Muslim skull cap, drawing condemnation from the BJP which had dubbed it as insulting to the people of the North-East. The outspoken MP also kicked up a row with his remarks that no "good"
Hindu would favour a Ram temple in Ayodhya by demolishing somebody else's place of worship. The BJP reacted strongly, terming his party and its chief Rahul Gandhi "anti-Hindu".